Our alignment disks are made from either fluorescing or liquid crystal material to aid the alignment of ultraviolet (UV) to mid-infrared (MIR) beams. We offer Ø1/2" or Ø1" fluorescing, slow-fading phosphor disks unmounted, SM1-threaded (1.035"-40), RMS-threaded (0.800"-36), or mounted to a drop-in cage plate. The unmounted and cage-plate-mounted disks feature a centered Ø1.5 mm through hole, while the threaded disks have an alignment target. The graphs below detail the absorption and emission bands of these fluorescing, slow-fading phosphor disks, which are made of the same materials as those used in our laser viewing cards. 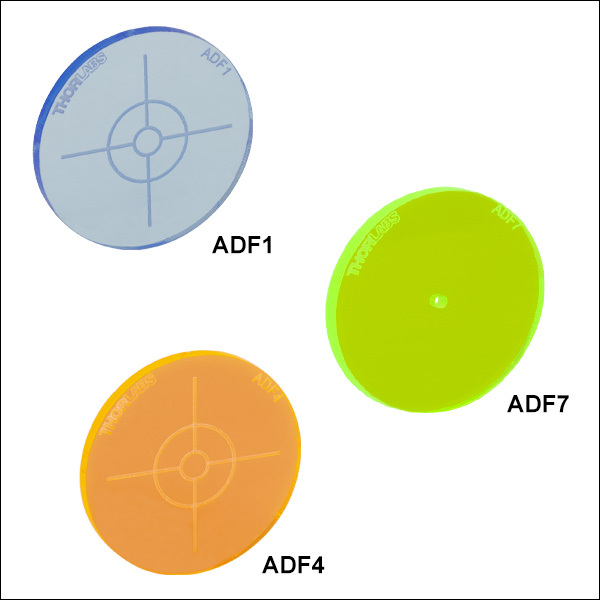 Our Ø1" fluorescing cast acrylic disks are available in five colors: blue, green, yellow, orange, and red. They feature target guide lines or center holes. These disks have fluorescence spectra similar to various fluorophores, making them ideal for use with a variety of lasers used in fluorescence imaging; see the graph below for more details. Our MIR liquid crystal alignment disks are available mounted to a drop-in cage plate with a Ø10.0 mm active region or a SM1-threaded disk with a Ø20.0 mm active region. 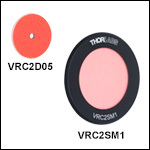 VRC1SM1 250 - 540 nm 450 to 750 nm Ø0.79"
800 - 1700 nm ~580 to 750 nm Ø1/2"
1500 - 1590 nm ~520 to 580 nm Ø1/2"
VRC6SCPTa 1.5 to >13.2 µm N/A Ø0.39"
Could you provide me with VRC2D1 and VRC4D1 without Ø1.5 mm hole in disk center? Thanks. Hello, thank you for contacting Thorlabs. Unfortunately providing VRC2D1 or VRC4D1 without the center hole will not be cost effective for small quantities, though it may be possible. 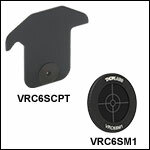 I would recommend the VRC2SM1 and VRC4SM1 instead, that feature target guide lines instead of center holes. In case a custom quote is necessary instead of these alternatives, we will reach out to you directly to discuss this further. 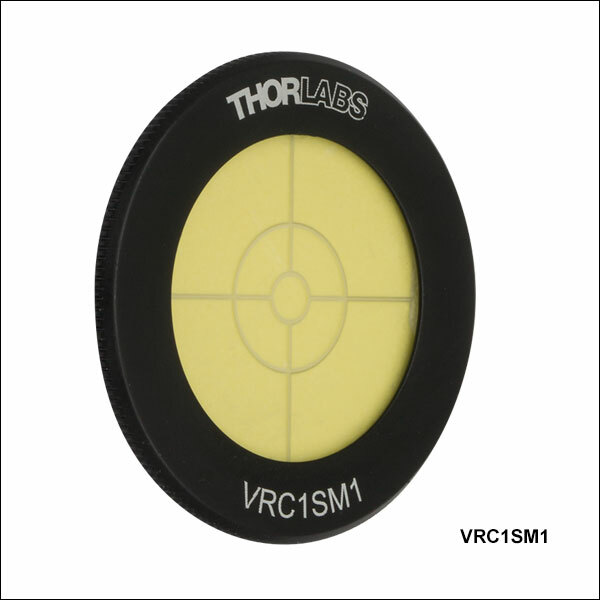 Hi, a VRC4RMS would be a very interesting product to add because the VRC2 material fade too much rapidly for a target use. Hello, thank you for contacting Thorlabs. I have posted your feedback in our internal engineering forum, and I will reach out to you directly about your application and IR source. Hello, thank you for contacting Thorlabs. I will reach out to you directly about this application. Can we please have these disks that detects UV as well? Possibly made from the same material as the VRC1 detector cards? Thanks! Response from Bweh at Thorlabs USA: Thanks for your feedback. We will look into expanding these alignment discs to include the VRC1 material. Response from Bweh at Thorlabs USA: This can be quite useful as well for certain alignment purposes. You can do this with a suitable glue and alignment jig or we can quote this as a special item. VRC2D1 smells like rotten eggs, it's digusting. Anyway you can improve that? 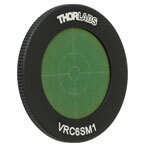 Response from Chris at Thorlabs: Thank you for your feedback. We can take this into consideration for any future versions, but at this time, there is nothing we can do about the scent of the alignment disk. Can we get the beam pass-through holes every 1/2" instead of just 1"? Response from Chris at Thorlabs: Thank you for your feedback. I will bring up your suggestion within our forums, but in the meantime, we can likely do this as a custom if you are interested. I will contact you directly about this. Response from Tim at Thorlabs: Thank you for sharing your idea with us! I agree that putting in a through hole would be a useful feature. A 5mm diameter hole would limit the use for smaller beam diameters and therefore may limit its value for some users. We would love to hear more feedback on this and would like to encourage others to post their opinions as well. For your immediate needs, we would be happy to provide this as a custom and I will contact you to get more information. 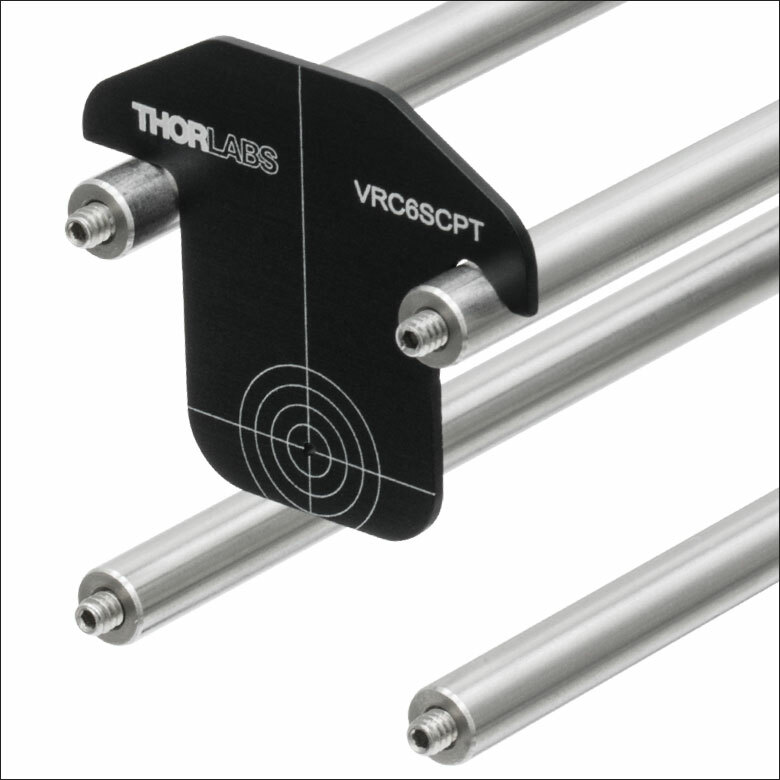 A response from Laurie at Thorlabs to acable: Thank you for your feedback concerning our alignment tool offering and the need for having our irises more strongly linked to this page, which is devoted to items that are solely used for alignment purposes. Thorlabs does indeed manufacture a wide selection of SM1-threaded irises, which are located on three different pages of our website. To make that connection more readily visible, we have moved irises from being the 5th related items link to being second on this page. As a result of your feedback, we also discovered that we didn't have any linkage from our iris pages back to this one. Thank you for taking the time to help us improve our website, and we hope these changes make it easier for you to navigate our product portfolio. Iris in SM1 housing seems to be missing from this page. Response from Javier at Thorlabs to last poster: thank you for your feedback. We can certainly modify an SM1A7 with a 1 mm diameter through hole like the LMR1AP. We can also expand the design of the LMR1AP with a new part that is compatible with the LM1-A and LM1-B nested mounts. Please send us an e-mail at techsupport@thorlabs.com to further discuss your requirements. You should make your threaded target (SM1A7) with a hole like your LMR1AP. Can you make a target that hangs on a LM1-A/B pair instead of threading in? A response from Adam at Thorlabs to Paul: I am in the process of looking into a custom option that would allow you to use our products at 780nm. If this custom option is available, we can also consider adding this to the new product line. 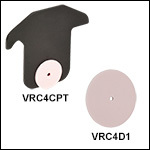 Oops, I meant to say that we bought a VRC4CPT, the one with the IR disk. The CPA1 and CPA2 plates dont have an IR disk. The following was done in a very dim lab. A 35 mW, 800 um beam of 780 will produce an extremely pale green dot on the target, but the dot is only visible if I turn my head and look at it through my laser goggles at an angle. Looking at it head on, it is invisible. The goggles are Kentek KRZ-C505C. They are OD 7+ at 532 and 755-810 nm, among others. And thats where my problem was: using other goggles, amber Thorlabs that are OD7 at 190-534 nm and I have measured to be OD 3.2 at 780 nm, I can see the green dot for about 25 mW, same waist size. I guess Ill have to switch goggles to do the aligning. It would be great if you could make an alignment plate like the VRC4CPT but using the material thats in the IRC3 card, now superseded by the VRC5 card. A response from Adam to Paul: At this time we do not have an IR alignment disk that works at 780nm. However, we would be interested in how our VRC4CPT would work at 780nm. We can provide you with a free sample if you would provide us with the test data. We are also looking into custom versions that may work for 780nm at this time. I bought a CPA1, not having noticed that it is not useful for 780 nm. Could you make one that works at 780 nm? In the meantime, I may consider sacrificing an old IR card. We also offer Ø1" unmounted fluorescent alignment disks. This alignment disk is designed to simplify the alignment of UV and visible beams. 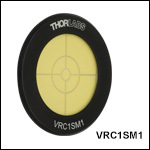 It is made from the same slow-fading phosphor material as our VRC1 laser viewing card and features a target that clearly marks the optical axis of any setup. The back of the disk features external SM1 (1.035"-40) threading for compatibility with our Ø1" lens tubes and optic mounts. Fluorescence of the 10 disks when illuminated with Thorlabs' Fiber-Coupled LEDs. Please see the raw data file for the LEDs used to obtain these fluorescence spectra. This data is typical; performance may vary from lot to lot. These disks are designed to aid in the alignment of widefield, confocal, or multiphoton fluorescence imaging systems. The cast acrylic substrates provide fluorescence spectra similar to various fluorophores, making the disks ideal for use with a variety of lasers used in fluorescence imaging. 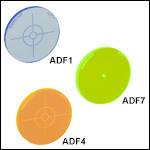 These disks provide a continuous fluorescent field so that field of view, illumination consistency, and sample alignment may be assessed and adjusted prior to using a sample containing a fluorophore. Each disk is 1" in diameter and is cut from cast acrylic material with a thickness of 1.7 ± 0.5 mm. Each disk features an engraved target with two concentric circles or a Ø1.5 mm center hole. For custom sizes up to 1' x 2', please contact Tech Support. For more details, please see the full web presentation. These disks can be mounted with our Ø1" fixed optic mounts, lens tubes, or 30 mm cage plates. 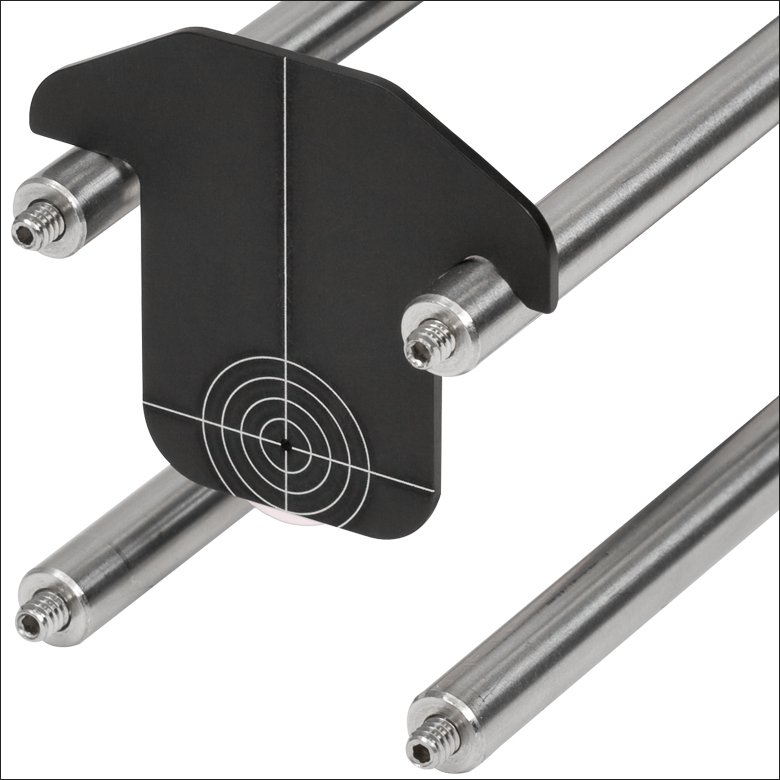 These alignment disks are designed to simplify the alignment of visible and IR beams. They are made from the same slow-fading phosphor material as our VRC2 laser viewing card. Ø1/2" and Ø1" unmounted versions are available. Alternatively, we offer alignment disks with external RMS (0.800"-36) or SM1 (1.035"-40) threading for compatibility with an RMS-threaded microscope objective lens or an SM1 lens tube system, respectively. These alignment disks are designed to simplify the alignment of IR beams. They are made from the same slow-fading phosphor material as our VRC4 laser viewing card. Ø1/2" and Ø1" unmounted disks are available, as well as a mounted disk with external SM1 (1.035"-40) threading on one side for compatibility with our Ø1" lens tubes. The VRC4CPT features an alignment disk mounted on a drop-in cage plate for quickly aligning a beam in a 30 mm cage system. The back side of the plate features a laser-engraved alignment target with Ø4 mm, Ø7 mm, Ø10 mm, and Ø13 mm concentric circles, as shown in the photo to the right. 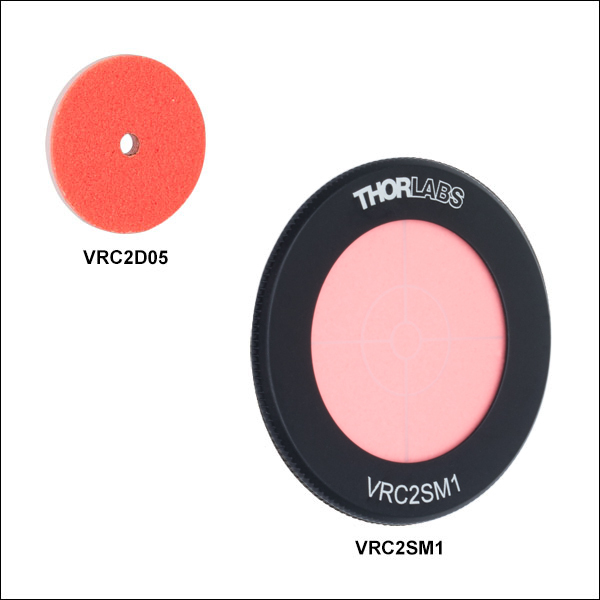 The active areas of the VRC6SM1 and VRC6SCPT alignment disks change color above 23° C.
The VRC6SCPT Cage-Plate-Mounted Alignment Disk and VRC6SM1 SM1-Threaded MIR Alignment Disk are made of the same material as our VRC6S Detector Card and have been tested with laser sources of wavelengths ranging from 1.5 µm to 13.2 µm. This VRC6SCPT is composed of an alignment disk adhered to an anodized aluminum cage alignment plate. The disk is positioned such that its Ø2.0 mm central hole is concentric with the plate's Ø0.9 mm through hole and aligned with the exact center of a 30 mm cage system. The back side of the plate features a laser-engraved alignment target with Ø4 mm, Ø7 mm, Ø10 mm, and Ø13 mm concentric circles (see photo to the right). 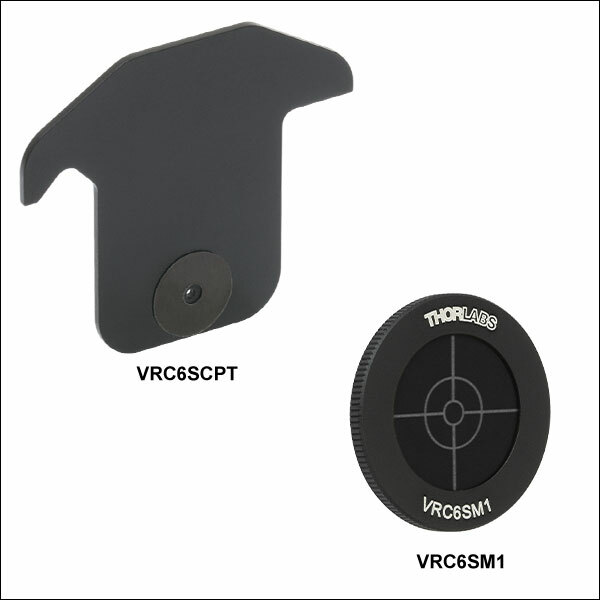 The VRC6SM1 consists of an alignment disk encased within an SM1 housing and is designed to simplify the alignment of MIR beams when used with an SM1 lens tube system. The active region of the VRC6SM1's disk is Ø0.79" with Ø3 mm and Ø9 mm concentric circular target guide lines (see photo to the left). The recommended ambient temperature range for these alignment disks is 20 to 24 °C, with peak sensitivity and responsivity at an ambient temperature of 22 °C. The detector area is black below approximately 23 °C. Above this temperature the detector will turn red, then yellow, then green and finally blue/violet around 28 °C (see photo to the left). This color change occurs whether heated by laser exposure or increased ambient temperature. The responsivity will be reduced when used at an ambient temperature below 20 °C since the material will require more time for the area exposed to the laser to reach a temperature above 23 °C, and the alignment disks will exhibit lower sensitivity above 24 °C since the color contrast between the laser-exposed region and the rest of the active region will be reduced. To restore the VRCS6M1 alignment disk after beam exposure, blow air on the active area with a duster such as the CA4-US or CA4-EU. The active area of the VRC6SCPT cage-plate-mounted alignment disk can be restored by resting the plate face down on a table top (i.e. an optical table with stainless steel surface) for a few minutes. These disks may take longer to recover after exposure to higher laser energy, and sometimes the color change may look permanent at room temperature. If this occurs, place the affected alignment disk in a refrigerator at 0 to 4 °C for a few minutes to accelerate the recovery. Please Note: The spot size on the disks will vary depending on power density. See the Laser Viewing Cards presentation for more information.